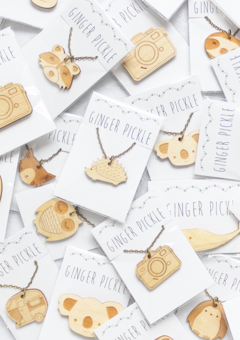 If you pop on over to my shop page you can explore the fun array of eco-friendly laser cut wooden jewellery with designs ranging from cats to koalas, camper vans to cameras plus many more. 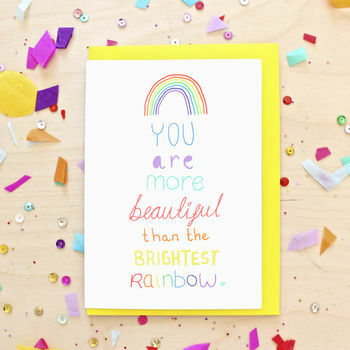 You can shop the colourful mix of inspirational art prints and greeting cards ready to uplift and bring cheer. 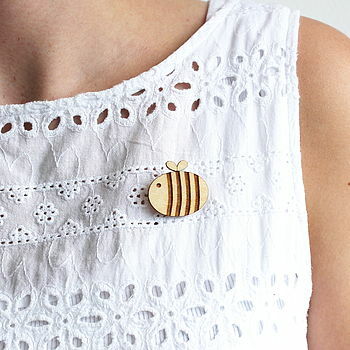 Laser cut jewellery made from FSC certified wood. 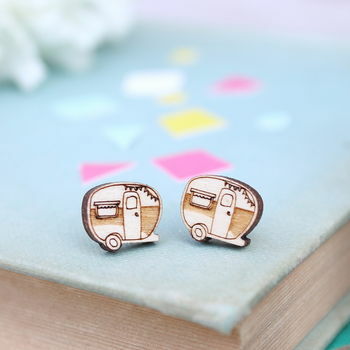 "Lovely quality quirky design. Excellent customer service from seller. Nicely packaged too"
"Ordered the turtle necklace before, cute & a lovely present." "Makes a nice Christmas present!" 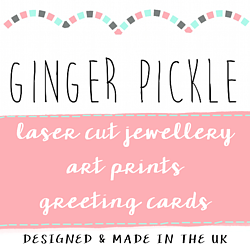 "Oh my – look at the absolutely irresistible cuteness that is Ginger Pickle. We want it all! Page 8"
"26 Products Every Whale Lover Needs In Their Home You whale love these! 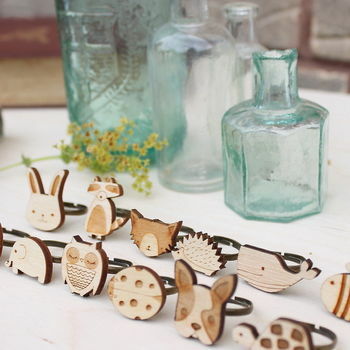 (no.18 wooden whale brooch)"
"Animal necklaces £10 Sweet laser-cut wooden necklaces featuring an array of animals"
"15+ Gift Ideas For Owl Lovers (No. 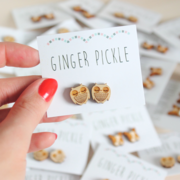 31 Wooden Owl Earrings)"
Ginger Pickle is based in the UK but we ship worldwide. We aim to ship items within 2 -3 days of receipt of your purchase so it gets to you in good time. Your parcel will be sent to the address given at the checkout. How are my items posted? All UK and international parcels are posted via Royal Mail. Parcels are posted by First Class standard for UK orders and International Mail for international orders. As we are based in the UK, please be aware that items may take longer to arrive depending on where you live. During the festive season your parcel may take longer to arrive and we recommend you order in plenty of time to allow for any delays that may occur. For international orders please contact me to arrange a faster shipping method if you require one. The cost will vary depending on the weight on the parcel and country it is being shipped to. How do you packaging my parcel? 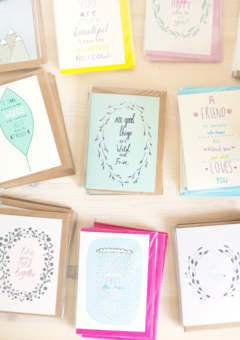 We take pride in packaging your items and want you to receive something that looks wonderful! 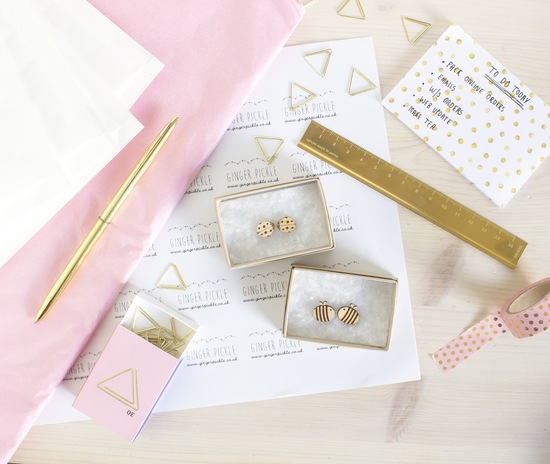 All jewellery will be packaged on branded card and posted secure in either a bubble lined mailer, small box or mailing envelope. Prints will be packaged in a biodegradable cellophane sleeve and protected with recycled grey mount board. Prints will be sent in a board backed envelope. Please feel free to get in touch if you have any more questions regarding our policies.